Back a couple of weeks ago, I featured a teaser image from a recent outing, one that I’m finally getting back to – but in the interim, we did that trip to the beach, which only added to the pattern that had been established. I don’t honestly think there’s anything more than coincidence at work here, but I’ll take advantage of it all the same. The last outing that I made before we had to get everything ready for the trip was to Duke Forest, which is normally a decent place to find snakes. 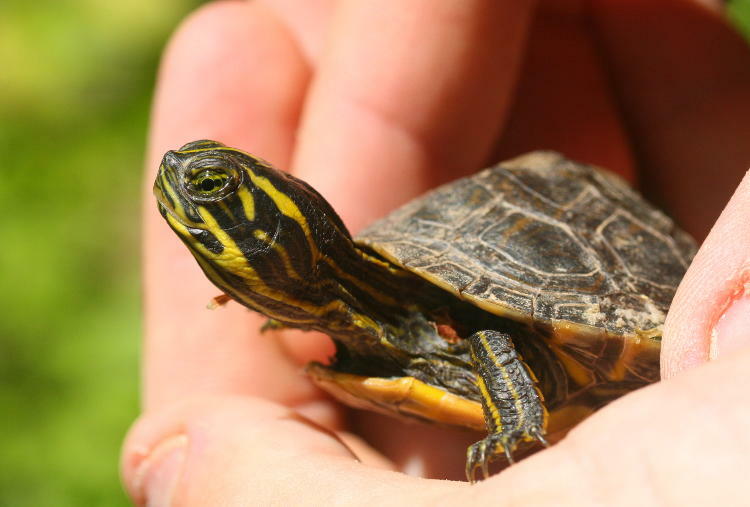 This time around the snakes were fairly scarce, and instead we were seeing turtles (among a few other subjects.) In a small pool formed by the fluctuating water levels in the creek, I unearthed a very small common snapping turtle (Chelydra serpentina) while chasing very small crayfish – if you want to see those you’ll have to refer to Mr Bugg’s blog, if he ever decides to post them, since I was the one holding them and didn’t have the ability to shoot them at the same time. 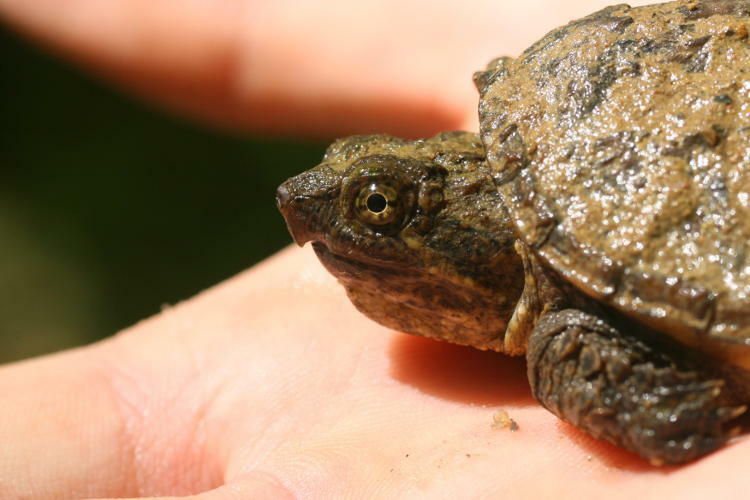 But after allowing him to get his own pics of the snapper, I handed it over to him to hold while I shot a few frames. It remained, for the most part, pretty docile for a minute or two, then decided it had had enough and began gaping and extending its head, looking for something to register its displeasure on in that special way snappers have, and so we returned it to the pool. There were plenty of crayfish in there to feed upon, and should those disappear, the creek was only a few meters away. 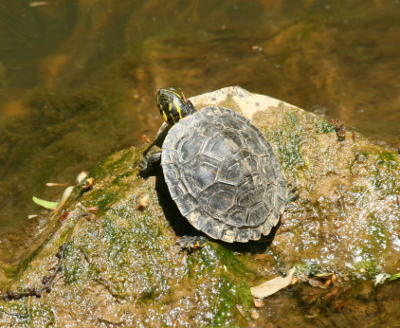 A little later on, I was looking across the creek from the spillway crossing and noticed a suspiciously dark smooth rock on the bank, a bit too far for a decent identification by eye, but a longer lens was sufficient to confirm my guess that it was another small turtle basking. Looking at it surroundings, I figured there was a decent chance to creep up on it from the shore, and so I made my way around and sprawled out on the bank behind the rocks to approach it, peeking up briefly to get my bearings, and then used the largest rock as cover until I could slip my hand around and cut off the turtle’s escape, which worked better than I’d hoped. Somehow, though, Mr Bugg was taking photos of my stalking right up until I made the capture when he stopped, and so there are no photos of this endeavor (I’m going to have to work on his photojournalism skills.) Still, we were able to do the nice scale and detail images that we were after. 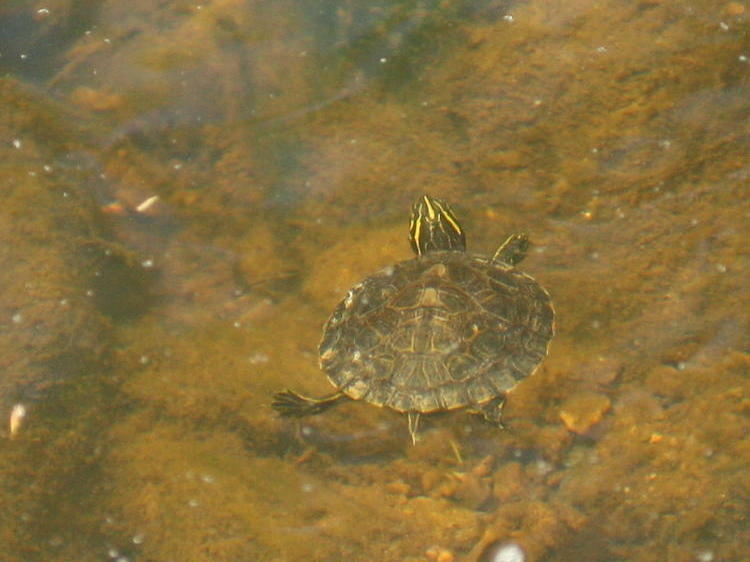 As I said earlier, I initially considered this a pond slider, but later determined that it was a river cooter (Pseudemys concinna,) mostly through the pattern on the plastron (belly) that I neglected to get any photos of. I’m still trying to impress upon myself the need to get a wide range of illustrations while I have subjects handy. No, that’s not at all close enough – let’s go in tighter on that same frame. Isn’t that adorable? Of course it is – I don’t even know why I ask. After our pics, we let it go back into the water right where it had been basking, and it (unsurprisingly) headed out into deeper water away from the bank as I followed its progress with the longer lens. But it didn’t go very far at all, actually. Within a few meters it found a rock protruding from the water and selected that as its new basking spot, pausing alongside and surveying the landscape for a bit to determine if it was safe – that’s the image that went with the teaser post. 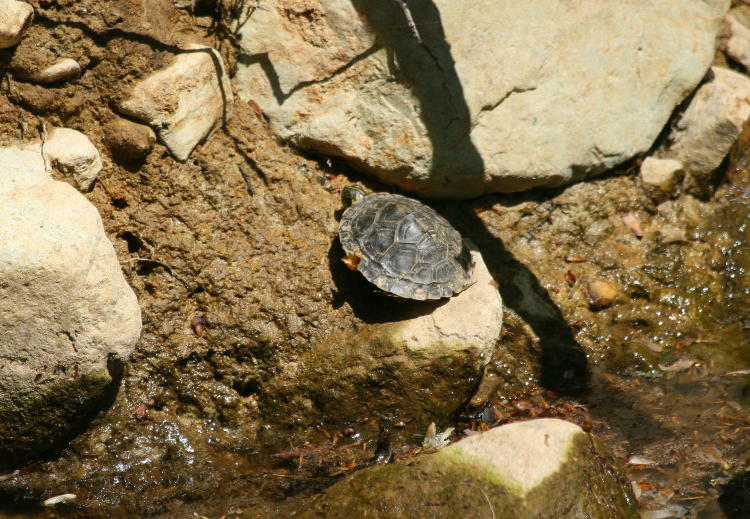 We left the immediate region and did a little more exploring, but when we came back a short while later, the same turtle was now basking in its new spot atop the rock, and wasn’t very concerned with our approach despite having a very clear view of us. I would have thought that, having been captured, it would have been exceptionally wary afterward, but then again we did get some flattering photos, so perhaps ego played a role here. I’m going to take a brief break here to tackle another subject while we’re still talking about Duke Forest, before we move on to Topsail Beach and the finds there. Chronologically I’m mucking about, because the following was actually our first find of the day, but I’m going to use it as an intermission. Right alongside the trail leading down to the creek, I spotted a snake curled up in the sun – not exactly a significant accomplishment given the coloration and the light, but it was partially hidden under a plant. I initially pegged it as a black rat snake, but as we maneuvered for a portrait angle, I realized we had something different on hand. That upturned snout is indicative of an eastern hognose snake (Heterodon platirhinos,) a species that has a remarkably broad range of coloration. While it’s easy to believe this image reflects an irritated demeanor from those ‘frowning’ eyes, that’s just skull structure, a supraorbital ridge that helps shield the eye, and indicates no emotion one way or another – most snakes have them to some degree, as do many raptors. 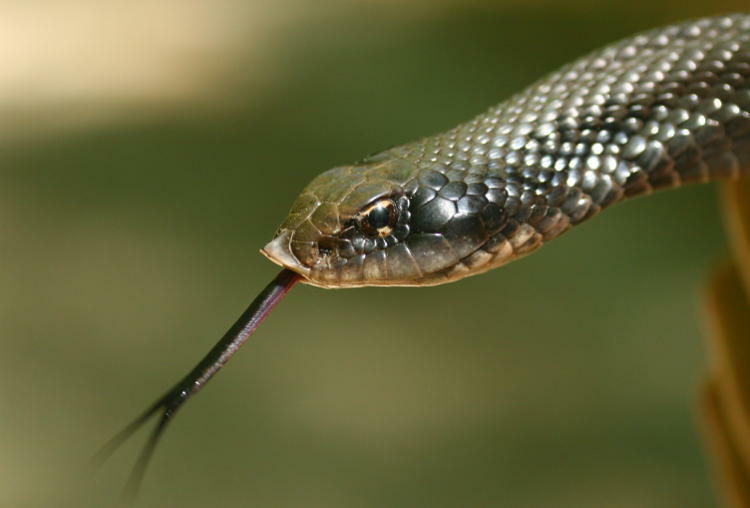 But hognose snakes, in fact, have a fantastic pair of responses to threats, and after we got our first images, I began trying to provoke either (or both.) Of course, when you’re counting on a critter to be defensive, it turns out to be remarkably docile, and displayed neither trait even as I picked it up. I’ll refer you to this page in the main gallery (a different species but closely related) as an example of both of those defensive behaviors, and a color variant that the eastern hognoses can be found in as well, save for a small difference in belly patterns. Once again, we have that apparent glare while the snake was actually being as tame as a duckling. I might have expected this had the night been cold, producing more of a torpor state from the reptiles we’d encountered, but no, it was plenty warm enough for exuberant activity – sometimes you just have cooperative subjects. I’m not knocking it, mind you. Okay, back to the turtles. On our first morning out at North Topsail Beach, after shooting the sunrise, I headed out behind the condo in the narrow band between the buildings and the marshy sound, and let me paint this picture for a second. We have the beach, and just behind the main dune sits a row of rental condos. Then the parking lot and the road, then another parking lot and row of rental condos, including ours. Then a small backyard of grass, bordered by a thin row of dense trees before you hit the sound. That’s literally an eight-meter wide bit of land for anything that likes grass and bushes and so on (though it probably widened off to either side of us, since we were on a very narrow portion of the island.) This might have made our backyard a kind of highway, the only patch of safe terrain for critters moving north and south, though ‘safe’ is a loaded term, because I was there! And I can’t recall whether I heard a faint rustle of movement or not, but essentially looked down alongside the small boardwalk to see this first sample of terrapins from the trip. 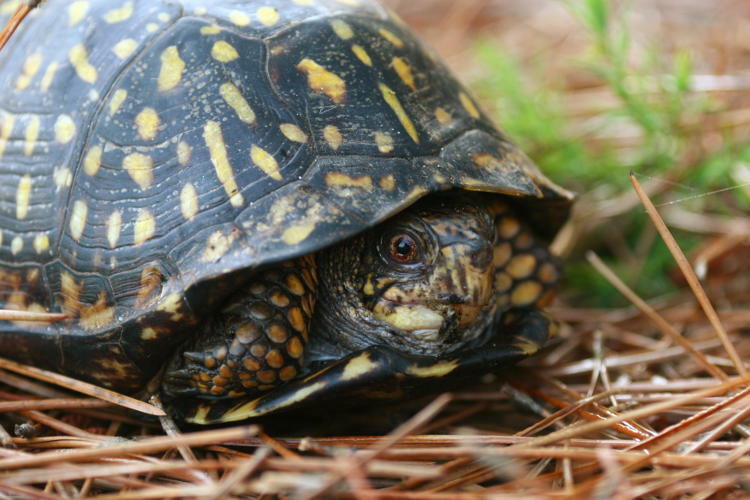 This is an eastern box turtle (Terrapene carolina carolina,) the state reptile of North Carolina – well, not this particular specimen, to my knowledge. This is likely a female, judging from the brown eyes and the flattened plastron not visible here. 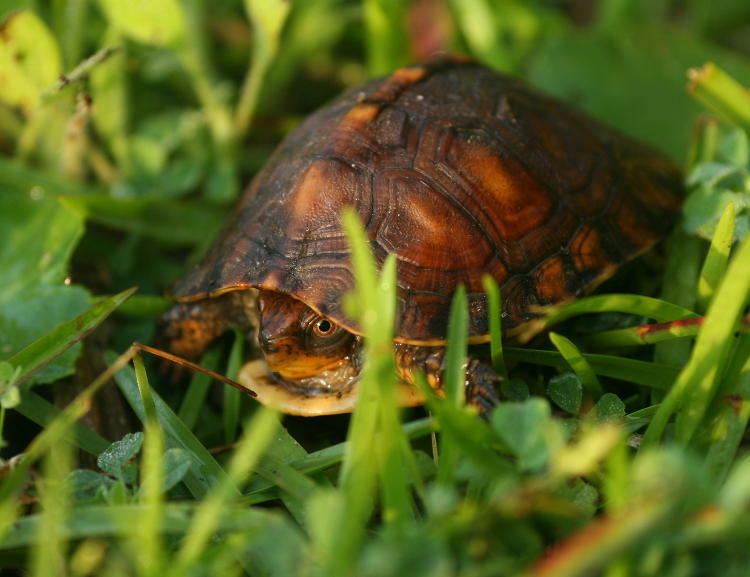 Like most box turtles, she went motionless as danger/photographer loomed, but made good time once I left her alone, as I found when I went on down to the gazebo for a few minutes and returned, then returned again with The Girlfriend to show her my find; by that time I had to reveal her in her hiding spot under a bush, which might have been her napping area in the heat of the day. I did it again the next day, this time slightly further off but still in the backyard (technically the neighbor’s, but it was all a shared area under the HOA.) I was able to use the early morning sun to light this diminutive example that was no more than 8cm in length, about a third of adult length (so much less than that in overall mass.) 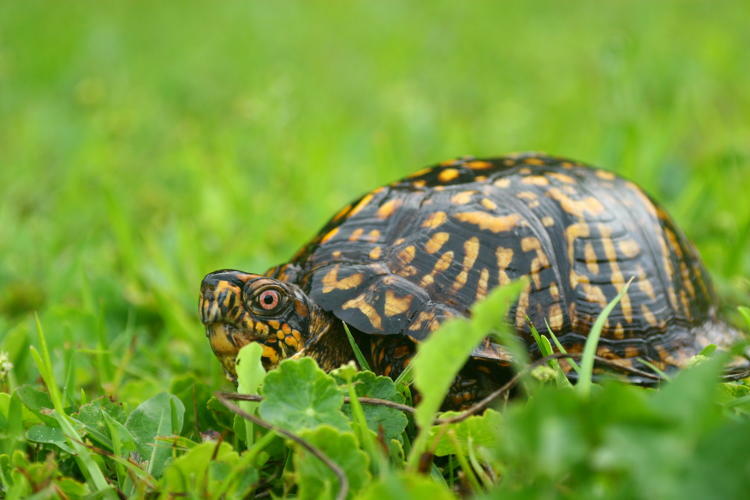 This is also an eastern box turtle, so you can see the variation in carapace coloration that can occur – and something else. Look carefully at the ridges on each scute (section or ‘shield’ of the shell.) This one is likely only two years old, since there is only one surrounding perimeter outside of the central hump on each scute, and compare this against the previous specimen, which is at least eight years old, but it looks to me more like ten – yes they grow a ridge every year, and the size of the ridges tells of their health and growth rate, some years being better than others. By the way, to get this perspective I had to lie flat on my belly in the early morning dew and got moderately soaked. I’m not complaining, I just don’t want you thinking that I’m not putting in the effort for you. I found another on a grey morning with bad light, when the macro flash rig was still up in the condo, so the handful of frames that I shot were all blurred by my motion and I discarded them. It’s not like I didn’t already have turtle photos. 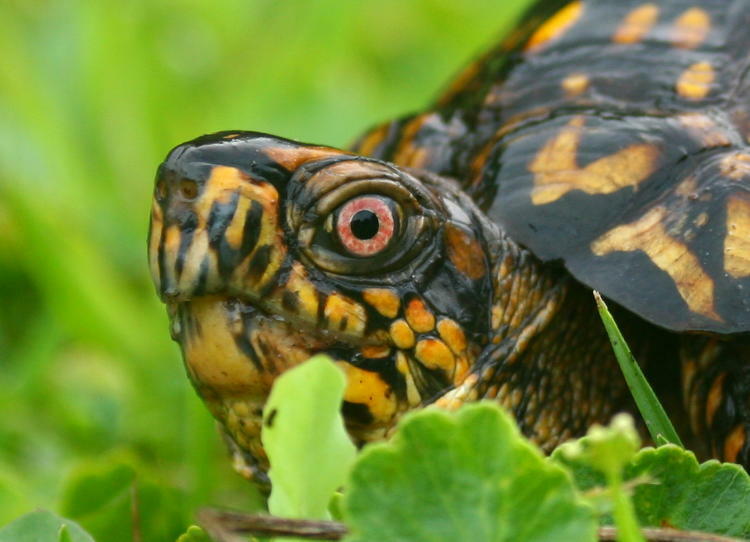 In my region of central NC, box turtles generally like a decent tree canopy and are most often found in the woods, blending in with the leaves very well, but at the beach of course there isn’t any such thing as a canopy, just little copses of trees here and there, so the turtles tended to spend more time in the open, though largely at night I suspect. And the last, taken the day before we left. This is likely a male, judging from the red eyes, but I didn’t inquire as to what it personally identified as. 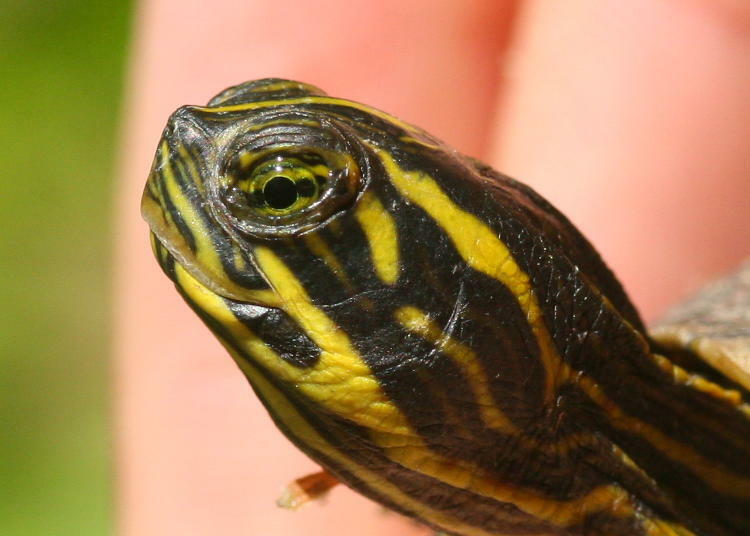 Turtles often have this ‘disapproving schoolmarm’ look to them, and to the extent that they have emotions, this is probably at least partially accurate when I’m getting down into their face like this. I’ll keep an eye open and see if I can show you a happy turtle someday, so you can contrast the expressions. Have I mentioned how much I like the Mamiya 80mm macro lens for this kind of work? I mean, within the past five posts? I’d hate for you to forget. Oh, what the hell. 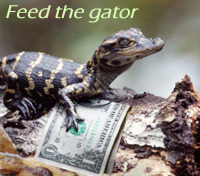 One more, off-topic, for giggles. 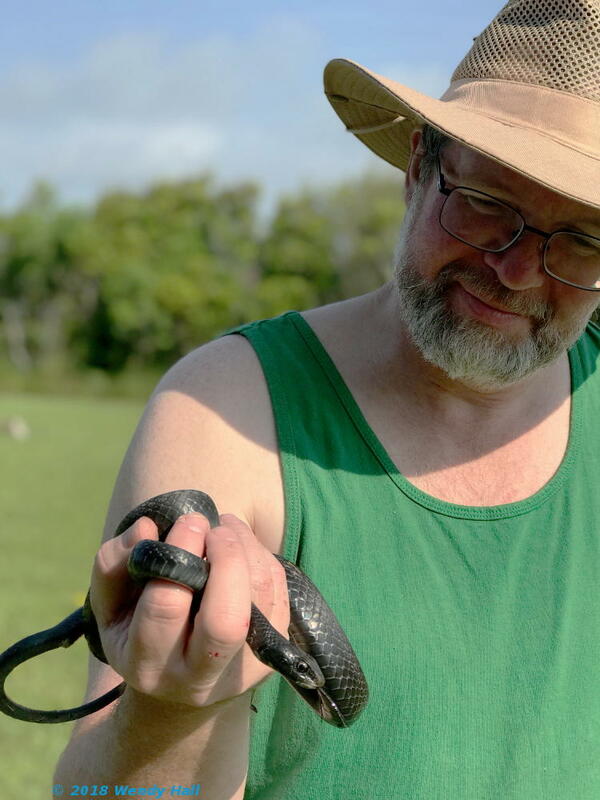 That’s me (the one on the right) holding another backyard find, what I’ve always called a black racer but it appears just ‘racer’ is the accepted common name, but either way it’s a Coluber constrictor. 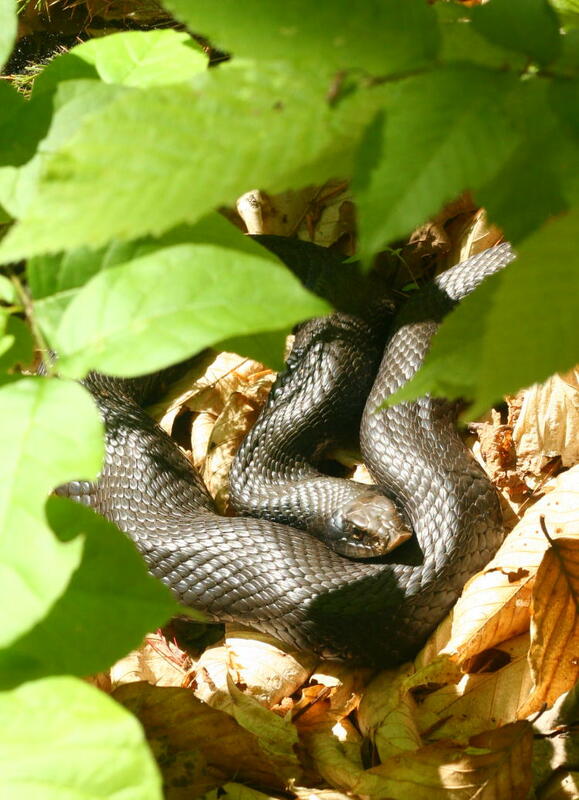 Which is funny, because they don’t constrict, unlike their almost-identical counterpart the black rat snake. I had just emerged from under the condo (most beachfront buildings are on stilts in NC – hurricanes, you know) and heard a rustle under the bush alongside me. I froze of course, to seek out the source, and immediately spotted my friend here with its head raised about a meter away – always pay attention to the sounds that ‘don’t belong.’ I maneuvered into a capture position, it darted off across the open grass, and I gave pursuit, much to the amusement of our friends watching from the balcony above. Unlike the rat snakes, racers often defend themselves vigorously, as can be witnessed by the blood spots on my fingers from several bites as I got a hold of it. You can also spot the ‘open’ vent towards the tail of the snake, evidence of their other means of defense, which is to defecate on you – it has a very distinctive smell that you won’t forget.